“The augmented reality wars have begun,” said Adario Strange in Mashable.com. This month, Google and Apple are both unveiling new tools to make augmented-reality smartphone apps, going head-to-head in a quest to dominate the next-generation te chnology. AR, in which digital objects are superimposed onto the real world, has been around for years, most infamously with the failed Google Glass smart spectacles. But 2016’s Pokémon Go craze, in which tens of millions of people around the globe went chasing after digital monsters seen through their phone screens, demonstrated that AR technology could be wildly popular. And just as importantly, it could be delivered to users via a device they already had. As a result, “you’re going to see an explosion of new AR apps this fall on your smartphone,” said Steve Kovach in BusinessInsider.com. Next week, Apple will release a new operating system that includes ARKit—new tools that make it easy for iOS developers to integrate AR features into their apps. Overnight, tens of millions of Apple devices—including every iPhone going back to the iPhone 6s, along with most iPads sold since early 2016— will be able to run AR. 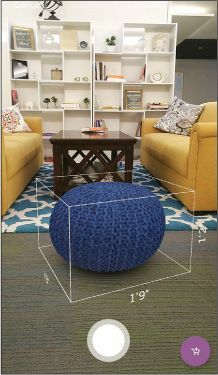 Google, in an attempt to head off its rival, last week debuted its own AR developer tool for Android called ARCore. That tool kit “will only work with a few Android phones at first,” but by the end of the year, AR should be enabled on about 100 million Android devices worldwide.